The last time Surya and his wife Jyothika stood together in front of the camera was perhaps for a television commercial shot for a leading telecommunication services provider. Once again the much talked about pair is ready to share the screen space together, this time too for an ad. "It was after much persuasion we were able to convince Jyothika for shooting," Surya says. "As a fan, I really miss Jyothika on screen. I have always been telling her to take up acting again. But she is not ready as her sole priority is to raise kids without any deviation," adds the top actor. 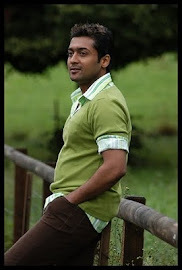 For Surya, life is so good after marrying Jo. "But for her, I wouldn’t have realised that life is this beautiful," he says. Surya however regrets that he was unable to gift his sweet heart something this Valentines Day, as they had to attend a close relative’s (producer Gnanavelraja) wedding in Coimbatore.